I've been binge reading lately, and my two favorite areas are Paranormal and Historical. This one fits into the later category and man does it deliver. 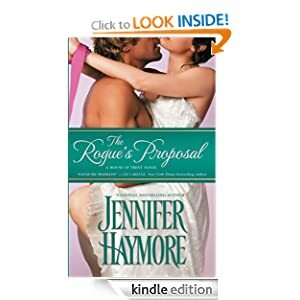 The Rogue's Proposal can be found on Amazon. Emma Curtis knows of Lord Lukas's rakish reputation-and hopes to use it to her advantage. While most men of honor would never travel alone with an unmarried woman, Luke is quite willing to take Emma on the road . . . and into his bed. As their journey carries them to unexpected places, Luke and Emma indulge their every passion and share their most private fantasies. But just when their deepest desires are finally within reach, a secret is revealed that threatens to end their love forever . . .
Regency romance is one of my favorites. And this does not disappoint. Rather than focusing on the heir of an aristocratic family, Haymore focuses on the "troubled" younger brother. *Swoon*. One of my favorite topics, and the fact that the heroine isn't aristocracy makes it even better. I love stories that aren't about the most privileged of the privileged, even if wealth is involved. I really liked the Character development and the plot, although I feel like some things are left unresolved (as part of a trope). But it was a bit predictable. I don't mind that too much, but it is the reason I knocked off a star. I also liked the way the main Hero developed. I was impressed with his growth over the course of the book. I feel for him, and I can see his plight. I thought she did a good job of ensuring that the readers would have empathy for him. Cover is a bit outdated (think 80's romance), but I love it. Editing is professional. Steamy, sometimes a bit too steamy a bit too soon, but overall well worth the price tag (6.84 on Amazon). I felt myself swooning as they came together (literally and figuratively). I highly recommend.